For any human being love is one of the biggest source of joy, happiness...problems and puzzles. Today's guest blogger, Aldo Caraceto, one of my fellow Application Engineers from Italy, is going to convince you to approach it from a different angle. I love music. One of my favourite songs is the popular Toto track "Hold The Line". Very briefly, this song is about love and timing, as you may infer from the main chorus of the song: "Hold the line, love isn't always on time". Ok, it's not always on time, but can I predict when it will be? To answer this question, I've found a couple of insightful works, "Strogatz, S.H. (1988), Love affairs and differential equations, Math. Magazine 61, 35" and "Eva M. Strawbridge, Romeo and Juliet, a Dynamical Love Affair" which I've translated in MATLAB code. 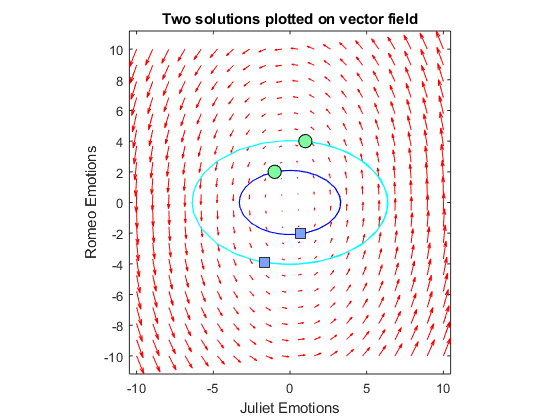 The mentioned papers answer a very simple question: how to express mathematically love dynamics, taking inspiration from "Romeo & Juliet" by W.Shakespeare. MATLAB may be a good friend to help us in examining the evolution of this relationship. 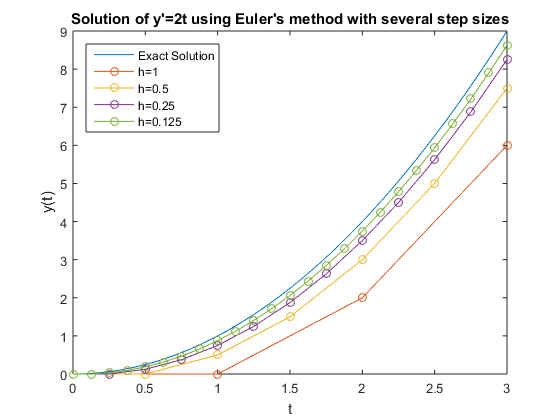 An ode23 solver has been used to solve the system of equations representing the story. The results are quite funny. 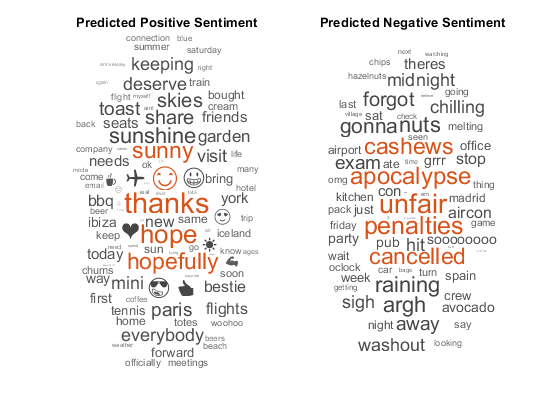 This first example examines the condition where each person’s feelings are only affected by the other. Besides, we want our Romeo not following the expected behaviour: in this case, he'll be a confused and confusing lover: the more Juliet loves him, the more he begins to dislike her, generating surprising reactions with regards to the original tragedy. R(t) = Romeo’s feelings for Juliet at time t .
J(t) = Juliet’s feelings for Romeo at time t.
R(t), J(t) > 0 signify love, passion, and attraction. R(t), J(t) < 0 values signify dislike. R(t),J(t) == 0 signifies indifference. In our first example, we have described the story with the changing emotions felt by Romeo and Juliet as they feed on each other's passion and indifference while the time is passing by. As you know, things - and people - are never so simple. 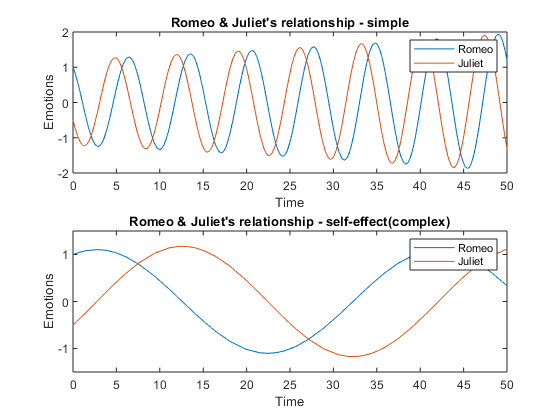 Let's try to describe the relationship between Romeo and Juliet a bit differently, trying to compare the first, simple representation of the relationship with a more complex version. Then, we'll plot them together. Here we've seen the impact of different models on the evolution of emotions; it looks like the chosen values tend to reduce the frequency of changes in emotions. Let's call it self-control (or selfishness). 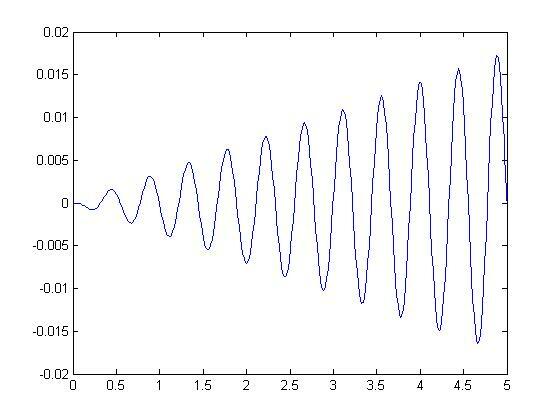 Phase plane analysis is a very important technique to study the behavior of dynamic systems; it covers a particularly relevant role in the nonlinear case, where widely applicable methods for computing analytical solutions are not available. In a nutshell, it basically consist of drawing the derivatives of solutions against the solutions in the phase plane. The derivatives of solutions are usually drawn in form of vector fields, to emphasize how large are changes in the solutions at a specific point in the phase plane and show the trajectories of the solutions, given specific initial conditions. Therefore, by superposing the two plots, it is possible to infer how the solutions might evolve, for the purposes to build our understanding under which conditions a system might stable or not. meshgrid creates two matrices: one for all the uu-values of the grid, and one for all the vv-values of the grid. Then, we consider x1 and x2 matrices: x1 will contain the value of y1' at each uu and vv position, while x2 will contain the value of y2' at each uu and vv position of our grid. Now we compute the vector field and plot the phase portrait. Our derivatives are computed for each point (y1, y2) at init_time = 0, through a for loop. We have obtained the phase portrait. 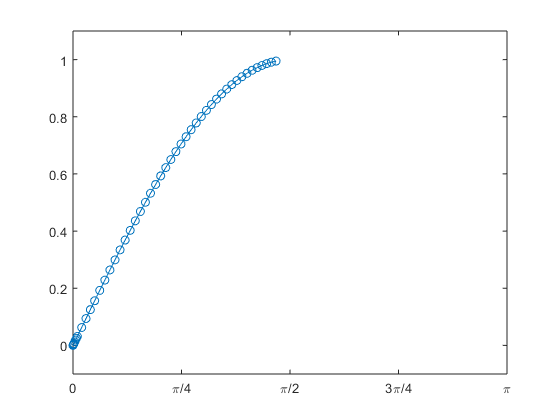 Finally we compute a couple of solutions and plot them, along with the phase portrait, on the phase plane. 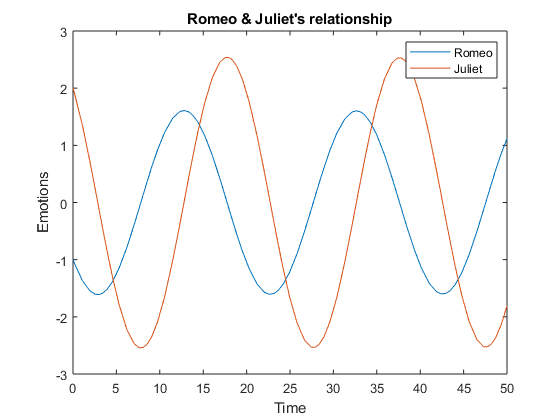 This is the first model of their relationship, just dependent on the a / b parameters, defining Romeo's / Juliet's attraction for her/his counterpart. b,c = Romeo's, Juliet's attraction for her/his counterpart. 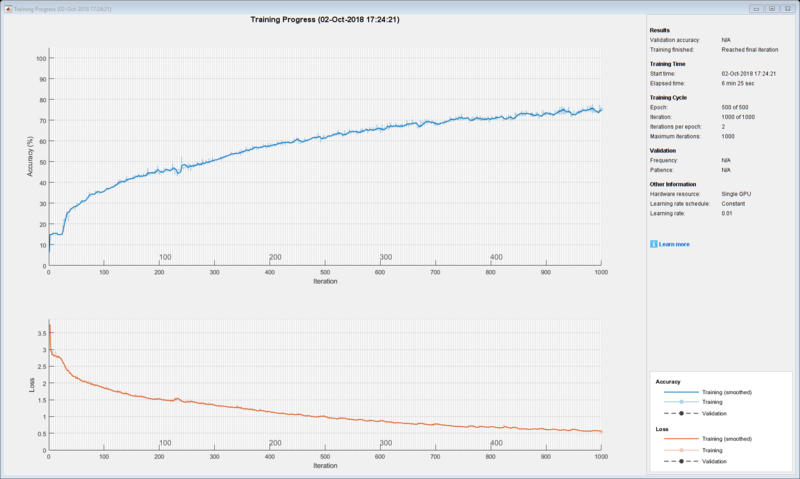 Today we have taken some steps in the analysis of this ''special'' dynamic system. Others can be done, exploiting tools already available in MATLAB. For example, making the system even more realistic, using the same ODE solver would have been a good deal or would you have chosen another one and why? Do you think calculating eigenvalues would have shed some more light on your understanding of the system? How would you do it in MATLAB? Try to answer these questions and ask yourself some new ones! Let us know what you think here. I think the model can be done non linear by making stronger (or weaker) the emotions feeling this couple. This can be done by introducing a term like: k r.j whish imply actual physical contact, insted the platonic and romantic one. Of course this can make the model chaotic. Hi Manuel, thanks for your comment. I perfectly agree with you with regards to the effect of adding a non-linear term: system dynamics can get more complex until reaching a deterministic chaos. In addition, this behavior may be investigated further by computing the bifurcation diagram for the non-linear parameter, in order to understand which values provoke chaotic dynamics. Perhaps, this could be material for a future post. I agree with you, studing phase space evolution must be a necessary step to understand the dynamic of this love entanglement. 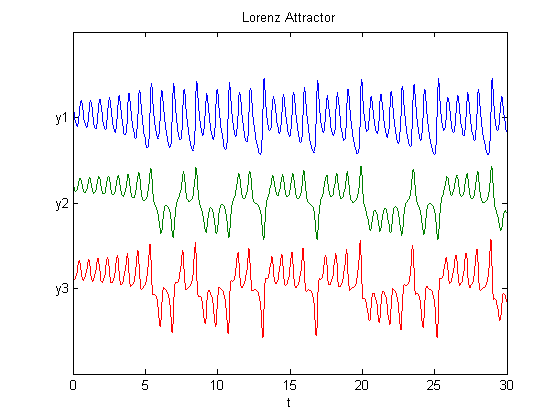 If you want more examples and in depth analysis: MODELING LOVE DYNAMICS (World Scientific Series on Nonlinear Science, Series A) by Sergio Rinaldi et al.